devorelebeaumonstre.com | Pittsburgh, PA | Fashion & Personal Style Blog by Stacey Belko: 70's babydoll. As I was standing in front of my closet contemplating what to wear, it was like the mail delivery man knew he needed to show up at my door right at that moment to drop off this dress that Motel sent over. I immediately threw it on with my favorite boots & out the door I went. Talk about perfect timing. Gorgeous dress, love the shades! Love this look, you suit those glasses so much!! Love the dress, it's so pretty! 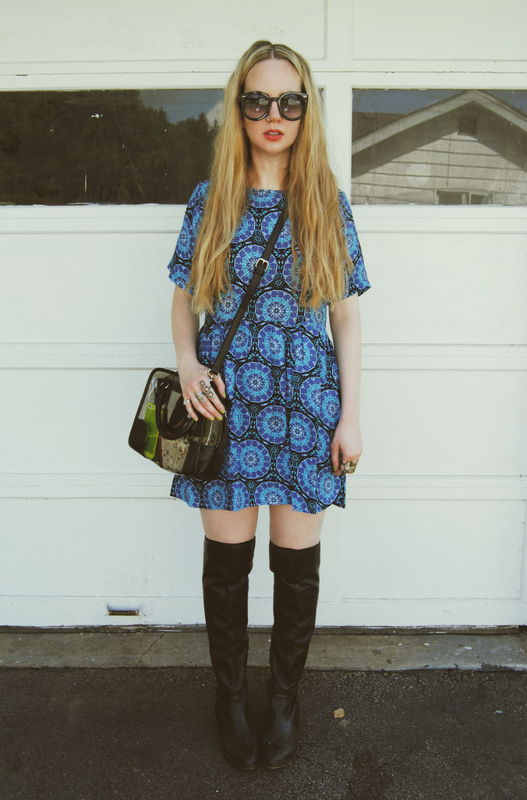 Cool dress and boots and everything! Lovely dress, really suits you!! so cool, love the print! Love your dress! Nice color and print! Your boots are everything, such an amazing pair! that pattern on this just is just beautiful! love it. You do look really cute like a doll! (I love your nose ring - is that weird?) And this is the epitome of a perfect spring outfit - which it's the first day of in Australia ;) Cheers for the inspiration! I love the dress :) And your transparent bag = cute! So vintage look! Great on you! A little bit more feminine than what you usually do, but still you! Lovin' it. You are so pretty and love that outfit, especially the dress! I was looking at this dress last week but I wasn't sure how to style it. Seeing you wearing it so perfectly I may have to buy it! The dress is so hippy and cool* Love it. I adore the print on this dress, so cool! lovely pics! Those boots are incredible! I must have them! Ooooh gosh I love this outfit :-D Head to toe, perfect! Beautiful outfit! Love your post. Very, very beautiful look! I love the 70s vibe! I only just discovered your blog, love the boots and the picture! That was so funny! I guess that's the dream of every single girl... While facing the morning nightmare of not knowing what to wear, suddenly, someone appears on the front door delivering a brand new cute dress! haha :) the pattern is lovely!